I’ve now made the decision to dip into my Dove stash, and I think that Dove Go Fresh Nectarine & White Ginger is still amazing. 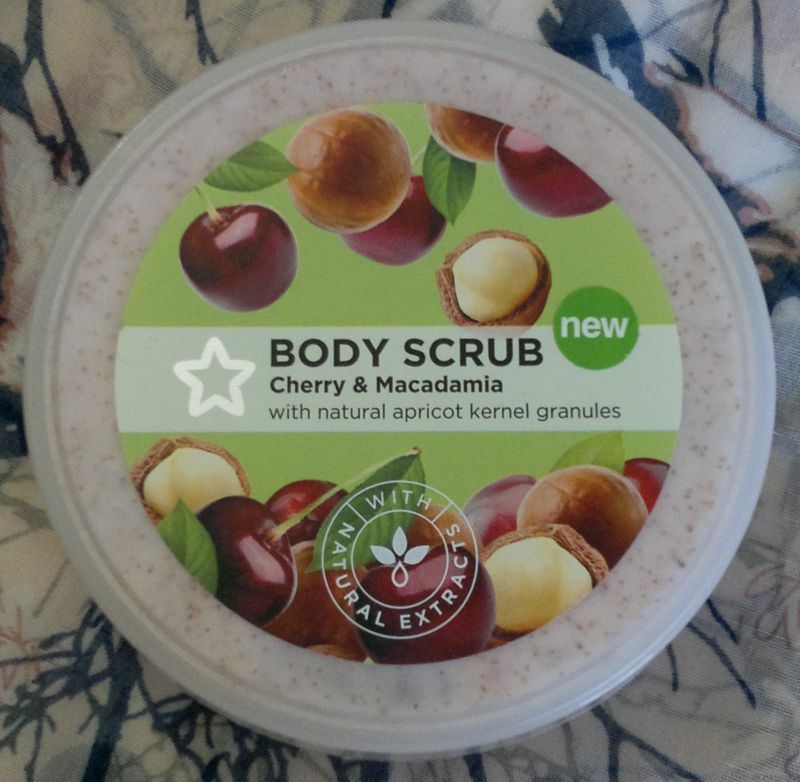 It feels great on my skin, and it smells like nectarine yoghurt with a hint of ginger. It’s fruity, sweet, but also refreshing. My husband loves the shower gel too. I have no doubt we’ll be going through this one quickly. 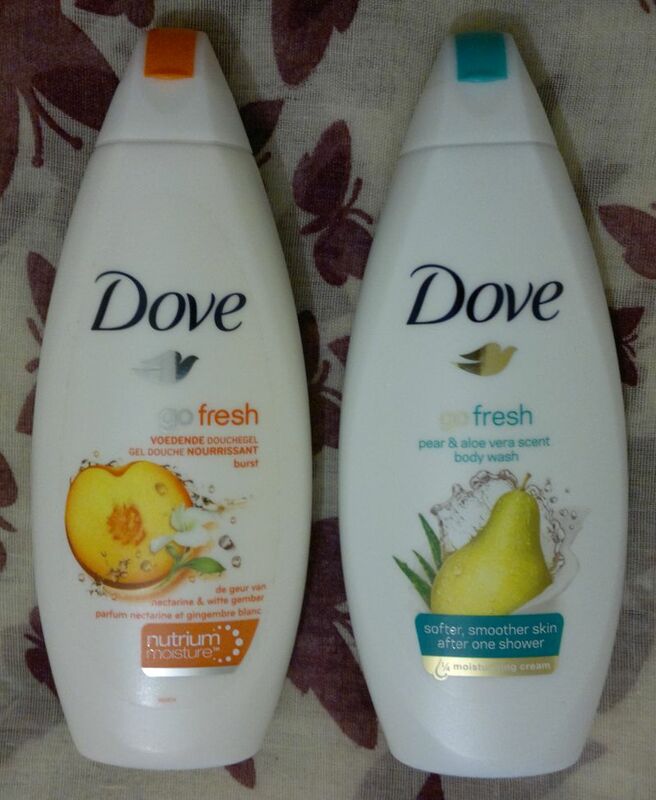 Dove Go Fresh Pear & Aloe Vera is simply wonderful. The formula is kind to skin, and the shower gel smells of juicy pears and aloe vera. I love the refreshing fragrance, and my husband is quite fond of this shower gel too. Dove did a great job with this one! Hi there! Today’s post is about 2 new Palmolive shower gels which I picked up at my local Wilko store – Palmolive Aroma Moments Just Fabulous and Palmolive Aroma Moments So Luminous. 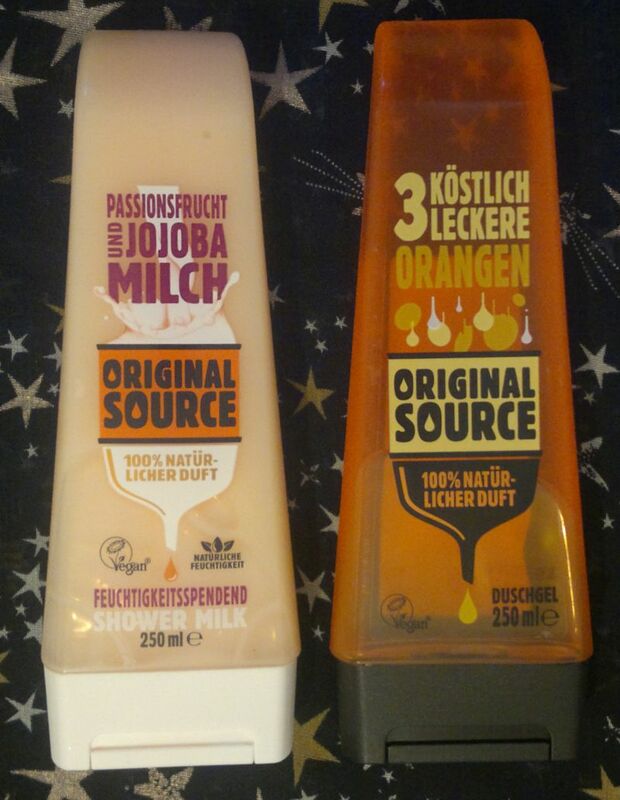 These 2 shower gels contain oils which promise to leave your skin feeling soft. I’ve now tried these shower gels, and here’s what I think. Palmolive Aroma Moments Just Fabulous with iris extract and avocado oil is a revelation. It smells of velvety iris petals, and it feels amazing on my skin. If you want a shower gel that feels luxuriously and that goes with Prada’s Infusion d’Iris fragrance, this is what you’re looking for! Great stuff, Palmolive! Palmolive Aroma Moments So Luminous with peony extract and macadamia oil feels wonderful on my skin too. The fragrance is more nutty than floral. 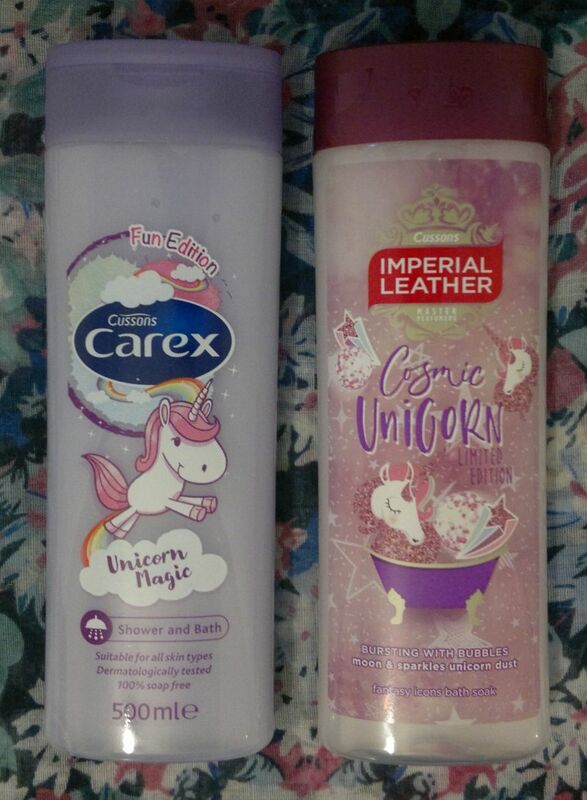 I like it a lot, but of these two shower gels, I prefer the iris and avocado one. 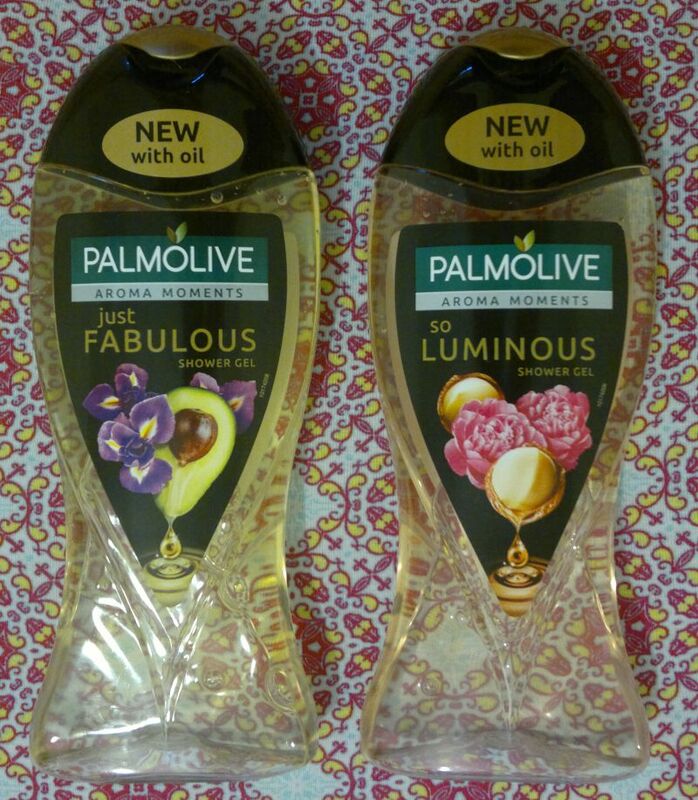 Palmolive Aroma Moments Just Fabulous and Palmolive Aroma Moments So Luminous are available as 250ml each. Prices vary depending on where you shop. I paid 90p each (special offer). Hi there! Today’s post is about Treacle Moon Happy Melon Sorbet and Treacle Moon Sugared Grapefruit Sunrise. A few weeks ago, one of my friends picked up a set of 5 travel-sized Treacle Moon shower gels. 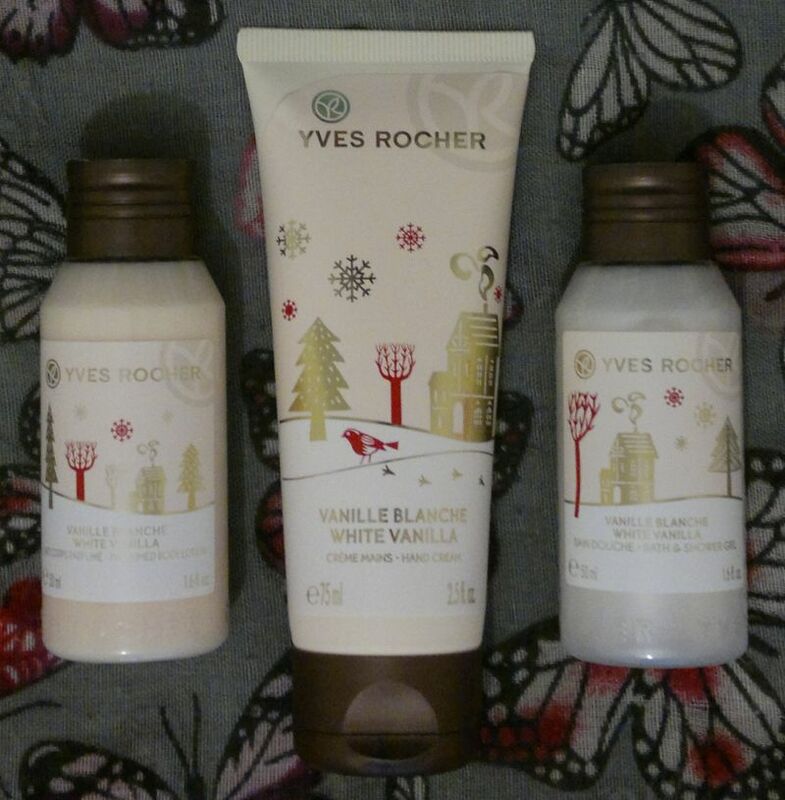 My friend knows that I love fresh and fruity toiletries, so she gave me these 2 60ml shower gels. I’ve now tried (and finished) them, and here’s what I think. Treacle Moon Happy Melon Sorbet is simply wonderful. The sunny honeydew melon fragrance is 100% spot on. I love it! I hope Treacle Moon launches this fragrance in the UK. I’d be more than happy to pick up those giant 500ml bottles on a regular basis! Since I love all things grapefruit, I had high hopes for Treacle Moon‘s Sugared Grapefruit Sunrise. However, this shower gel isn’t great. It smells like warm plastic and fruit. If I hadn’t known that it’s supposed to be a grapefruit fragrance, I would never have guessed it! I’ve also looked up every single grapefruit shower gel that I’ve used over the past 4 years (thanks to my blog, this took me less than 2 minutes), and this one is the only one I didn’t like. Treacle Moon Happy Melon Sorbet and Treacle Moon Sugared Grapefruit Sunrise are available as part of a 5-piece shower gel gift set (5x60ml). My friend bough the set in Germany. 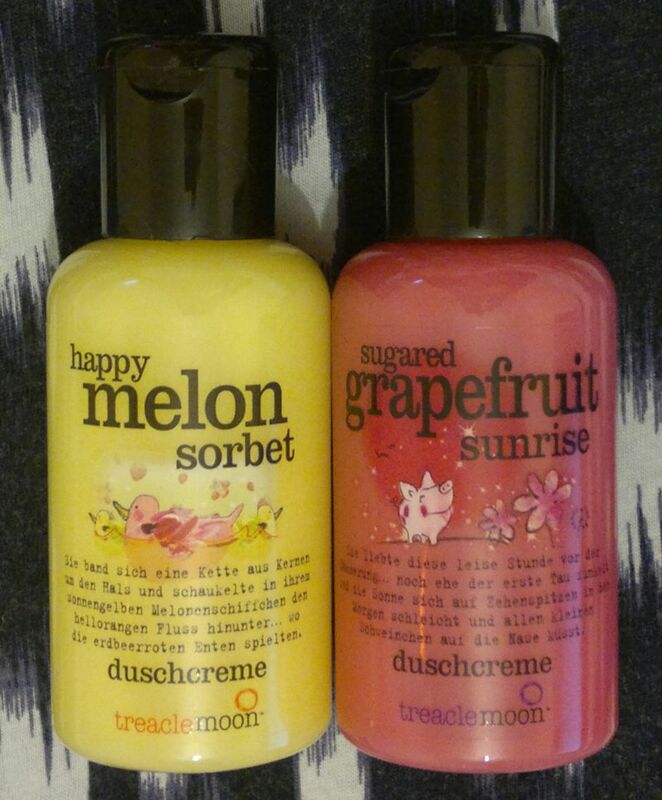 I have never come across these 2 fragrances over here in the UK, but I’ll keep my eyes peeled for Happy Melon Sorbet!